Please send your images, so we can put them in our PHOTO ALBUM. I just wanted to drop you a quick note about these lures. I can not believe I have not seen these before in the big box outdoor stores. These lures are absolutely amazing! They allowed me to fish weeds that other big name weedless lures would not without constatnt frustration of picking weeds off my lure. This by far is the best weedless lure ever. Here are just a few picks of some pike we caught on our trip to Canada with your lures. I will be ordering more. We purchased some weedless fishing lures at the Sportman's show in St. Cloud. You told us to send you a picture if we got a big fish with the lure but we can't because it got away. We have a cabin on Lake Poinsett in South Dakota & last weekend we went to check on it. Since you can fish all year round in SD my 12 year old son decided to try fishing with the weedless lure. We could actually see the northerns by the shore so he started casting. After a few casts he caught a 3 lb. northern & he was really excited. A few casts later his pole was bending almost in half & he was fighting to get a fish to shore. It came out of the water & it looked like a small alligator. It was the biggest northern we have ever seen. I caught a 10 lb. northern some years ago but this one was bigger. Unfortunately it broke his line & took the lure with it. He is determined that he is going back to get that fish. Since he loves to fish I have a feeling that he just might catch it. He was using the pink & black lure & he thinks it's the best lure he has ever used. We only bought one pick & black but he is hoping that the other color lure will work just as good. If he does catch it you will definitely get a picture. I fish with my old stand by spinners just to get a feel for the fish. They would usually follow and nibble, but I can not get them to bite. Then I switched to my weedless lures and started going through the colors. My rainbow nabbed a nice five pounder. Then I lost the lure to a bad knot. Then I switched up colors a few times and did have 10 or so pike follow but not a set. Then I switched to the metallics, copper and copper hammered. I nailed four pike in fifteen minutes. I let a couple go. The average that I kept over the weekend was five to six pounds. Later that afternoon I got my stepson. We got back to the my spot and he had his first northern pike ever in two casts with the copper. It was about five pounds. It was nice to be catching and not fishing for once!. The next morning my stepson actually woke me up to go fishing! See he has been very discouraged, last season we got pretty skunked, one bass all season. I am grateful for your lures, because he caught his second ever pike on his third cast with your weedless copper spoon that next morning. I wanted to express my gratitude to you about my weedless lure experience. I love your product... it has brought this family closer! I have enclosed an order for Weedless Fishtraps. I look forward to using them and reminiscing about how my father introduced me to the Fishtrap while fishing for pike in Ontario back in the late fifties and early sixties. Back then he spent a lot of time working to get us out of snags and weeds. The Fishtrap helped free him from fustration, kept us all fishing and, most importantly, catching fish. I have never fished with a more successful pike lure in my life! 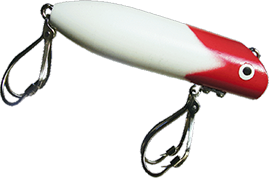 Your weedless spoon is the best I have ever used - I can fish through deep weeds and have pulled a lot of pike out of weeds with it. My friends can't believe how it will not get caught. I have used the same spoon for about five years and it has a lot of teeth marks on it. I think it is the best pike lure ever - I am so glad you are still making them. I grew up in the late 60's early 70's trolling with my grandfather using the Fishtrap exclusively. We always had more sucess than anyone else at the resort. I am glad I found you so I can continue to outfish everyone else. "I thought you would like to know that last year fishing Eagle Lake in Ontario, I landed a 44" Northern using a Fishtrap spoon. This is the 2nd time I have fished Eagle Lake with your Fishtrap lure and find the pike love it. I am going back this summer. Too many teeth marks on the used Fishtraps." I stumbled on your booth a decade ago at a sport show and was impressed with the spoon design as a solution to successfully fishing monster northern (20+ lbs) in weeds. In the last 10 years I have caught dozens of trophy northerns on your weedless spoons. I finally need to order more, not because I lose them from snags but because the fish break the line or the lures have so many teeth marks on them that there is no paint left! Your lures are an awesome solution to pulling the really big boys out from the thick weeds where no other lure can go. Thanks for the memories. PS: I just ordered 32 more lures today. My tackle box can not be without them. I have attached one of my latest catches for your viewing pleasure. Love your products. they were the best producers so far this year. I had a hell of a time finding replacements for lost ones. I got your name off an old package on the 705. I will order some soon. Silver has been the best color so far with yellow/black next. Keep up the good work. After nine years absent from our usual Canada fishing trip we had the chance to get out on Rainy Lake to Red Gut Bay this year. Like we have in the past, we stopped at Sportman's in International Falls to pick up a new stock of FishTraps. To our surprise, they had not carried them in the last four or five years because their vendor no longer carried them! I was heart broken to hear that the lure I used the most was no longer available. I gave one of the guys we were fishing with my extra black and white and red and white so he could enjoy fishing with being hung up. To my dismay I lost my only black and white left on the trip this year and I was determined to track down the now allusive FishTrap. Upon finding your website I immediatly ordered nine new FishTraps! I will restock my supply and give a few to my Father as a stocking stuffer this year. Thank you for many years of "weedless" fishing! After nine years absent from our usual Canada fishing trip we had the chance to get out on Rainy Lake to Red Gut Bay this year. Like we have in the past, we stopped at Sportman's in International Falls to pick up a new stock of FishTraps. To our surprise, they had not carried them in the last four or five years because their vendor no longer carried them! I was heart broken to hear that the lure I used the most was no longer available. I gave one of the guys we were fishing with my extra black and white and red and white so he could enjoy fishing with being hung up. To my dismay I lost my only black and white left on the trip this year and I was determined to track down the now allusive FishTrap. Upon finding your website I immediatly ordered nine new FishTraps! I will restock my supply and give a few to my Father as a stocki ng stuffer this year. Thank you for many years of "weedless" fishing! My son and I used your weedless spoons on the English River in Canada. We have never cought so many northern pike in our lives! Our guide had never seen one before. he warned us there would be a lot of weeds. we said thats what we wanted. he couldnt belive we cought so many fish that day. we would like to thank you guys for one of if not the best day of fishing we have had. 20 Years ago I told one of my customers about a trip I was taking to Canada. He told me he had an old lure called a fish trap he wanted me to use to catch Northern with. My first afternoon fishing for Northern was very exciting. I would throw the lure into the reeds and slowly pull it back towards me and bang fish on. I gave the lure back to my customer after the trip and hoped I would be able to find another somewhere. When I came across your web site I was glad to see the lure has made a comeback. Several years ago I bought several fish traps red/white and they have hundreds of teeth marks on them. Two years ago I caught several 49-50” Northern in Manitoba. using the fish trap and I swear by them. It works believe it.